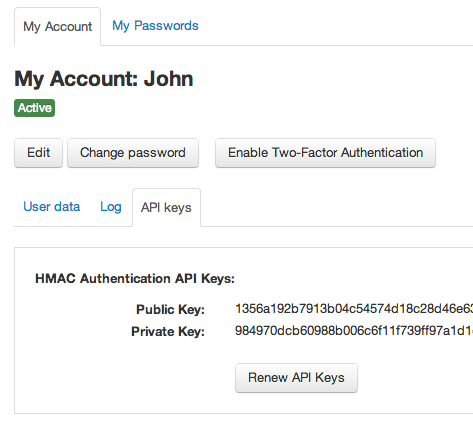 The API provides two methods for authenticating requests: HTTP Basic Authentication and HMAC Authentication. HTTP basic authentication is the easiest and simplest way to authenticate API requests in Team Password Manager. It consists on sending with the request the username and password of the user who makes the request. Because of this we do not recommend HTTP basic authentication if your installation of Team Password Manager is using http. If your installation uses https then this is secure because all data are transmitted encrypted. Note that if the user is an LDAP user, Team Password Manager will transparently authenticate the API request using LDAP, like if the user were signing in from the web interface. Also note that API authentication will NOT use Two-factor authentication if the user has 2FA enabled. HMAC (Hash Message Authentication Code) authentication is more complex to use but we consider it more secure, specially if your Team Password Manager installation is using http. A user in Team Password Manager has a public key and a private key ("API Keys" tab in "My Account"). The application using the API creates a unique HMAC (a hash) that represents the request. This hash is created using the private key combining a part of the request URL with a timestamp and the request body (if it exists). The application sends the request with the public key and the HMAC, as well as the rest of the data. Team Password Manager looks for the public key in the user database, retrieves its corresponding private key and tries to re-create the HMAC using the received request data. Team Password Manager then compares the two HMACs. If they're equal, the request is authorized. As you can see only the public key of the user is transmitted. The private key is a secret that only Team Password Manager and the client application know, and it's never transmitted. Let's put the concept into practice using PHP. You can also use curl or the language of your choice, but we find it easier to explain it using PHP. Note: if you want to use this authentication method, the Hash extension (http://php.net/manual/en/book.hash.php) must be installed and the "sha256" algorithm present. 1. The URL part that starts after "index.php/". Example: https://tpm.mydomain.com/index.php/api/v2/projects.json. This value can't have any leading or trailing "/". 2. A timestamp created with the time() function. Note: this hash value must be in lowercase. Take this into consideration if the system you're using defaults to uppercase. X-Public-Key: the public key of the user. X-Request-Hash: the HMAC calculated in step 2. X-Request-Timestamp: the timestamp from step 2. Note that here there isn't the call to curl_setopt with the username and password used in HTTP Basic Authentication.